The Clacka Max was developed in reponse to requests for a boat large enough for four or five passengers or to carry a big load of camp gear. 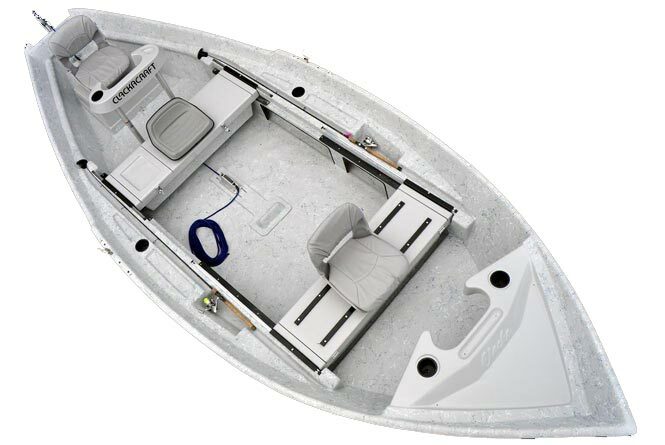 The Max can handle up to five passengers in addition to the oarsman. The Max has ClackCraft’s tunnel hull with tracking channels and Gulfstream® bottom to ensure that it will handle well and row easily, even with several passengers and a heavy load of gear. 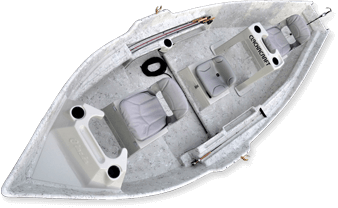 Seating options include two seats on a bench or on pedestals (side by side or in a row ahead of the rower’s seat), rear pedestal seat with knee brace, and two additional portable seats that double as camp chairs. Rear knee brace is removable pipe style shown here. Two passengers’ seats and your choice of knee brace are standard. Talk to your salesperson to determine interior design of your Max.